Each year, new ideas a brought to life in the interiors of our homes. Everyone wants their home to be new, fresh, and unique. Meals involving a lot of chopping, rolling and other similar maneuvers may require a lower countertop. It could be as easy as installing a lower stop from your regular height countertop island. This statement-making look is contemporary and complements a variety of materials and styles. Be on the lookout for this trend in both the bathroom and the kitchen. Last year we saw many beautiful kitchens with a classic white palette. As homeowners look for personal touches in their homes, you will see more color arrive in kitchens this year. Have you ever heard of a countertop that takes care of salmonella bacteria for you? The new K-Life technology incorporated into Porcelanosa’s Krion solid surface is both antibacterial and air purifying as it eliminates chemicals that come into contact with it. This is through the process called photocatalysis. Big islands in the kitchen are being replaced with traditional tables with one goal in mind: family meals. The perks of this trend are to have the style and trend of modern wallpaper with the ease and ability to wipe down with a sponge and detergent. These glass shower panels allow a clear view to a statement shower tile and more natural light. The concrete trend has been growing in the last few years. Expect to see it in other areas of the home, including furniture, decorative accessories, wallcoverings, countertops and tile. A bold piece of furniture adds color to a room as well as a focal point. Ornate décor and busy patterns may not be ideal in a room you want to be relaxing and calm. Soothing neutrals verging onto a minimalist look are on the rise. Open floor plans have been on the rise, but if that’s not your style, consider a half wall of cabinetry to create a semi-closed space between rooms. 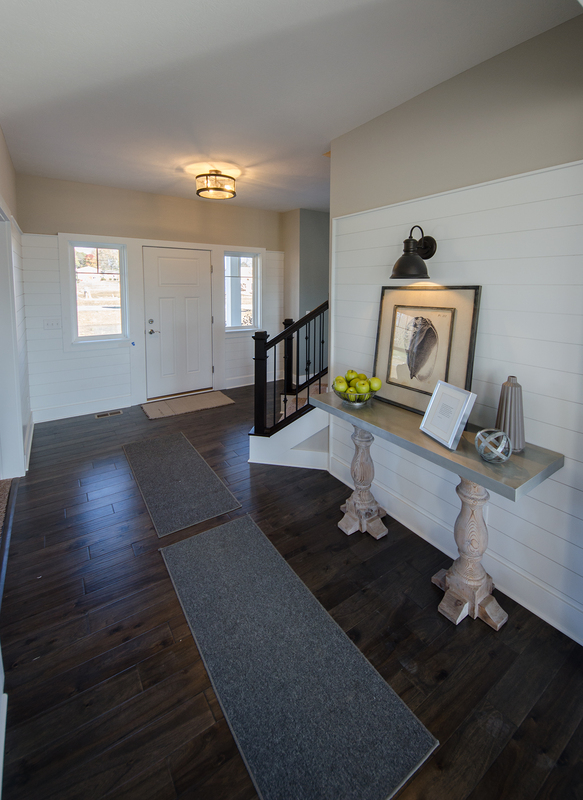 Millwork, shiplap, and reclaimed wood boards are trends that will stick around in 2018. These easy DIY updates make it personal to homeowners. If you have a more compact kitchen, a statement hood may not be ideal for your space. 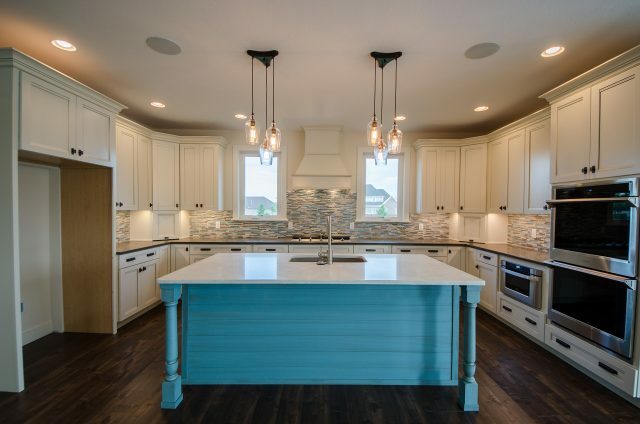 Consider hiding the hood behind some cabinetry. “People are mixing metallic elements and are paying more and more attention to sheen and texture,” says Jennifer Ott, Houzz Contributor. There are so many creative ways to make your countertop functional and trendy. Consider cutting grooves in butcher block to create drainage for wet dishes. These sinks are great for laundry rooms and kids bathrooms, while bringing out a modern farmhouse style. Subway tile isn’t going anywhere, but if you’ve grown tired of it, check out a scalloped or fish-scale pattern to liven up your kitchen. Warm grays and earthy shades bring a warm, sumptuous look. Rich colors like red, camel, rust bring an interesting flavor to a space. Vintage style has been a trend for years. This style of lighting brings a nice focal point in a room, adding a different solution to art in a space. Organizing all of your household cleaners and tools shouldn’t be an afterthought. Homeowners have become creative in their design tactics, using slim spaces and functional storage spaces. 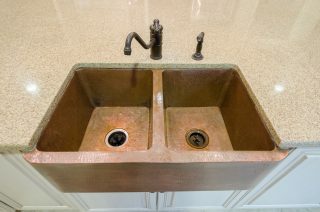 As concrete and copper become more popular in homes, expect white and stainless steel sinks to begin disappearing. Granite sinks with darker hues of gray make a great statement in a kitchen space. Expect a revival of this popular print. Botanical references have become the trend in many ways in homes.